No longer are journalism and media studies fields with niche positions. The landscape has become a convergent environment. The Hank Greenspun School of Journalism and Media Studies offers a diverse class selection and structures each class to promote convergence among fields for more successful graduates. What does convergence mean? It means that those within broadcast and print journalism, public relations, integrated marketing communications, and media studies professions are being asked to develop skills to perform tasks that were once segregated. For example, a broadcast personality now writes for on air, then writes and posts the story for the station’s website, and then uses social media appropriately to engage with followers and promote the story. With this in mind, the school encourages students to identify how they can use other parts of journalism and media studies to enhance their professional goals. 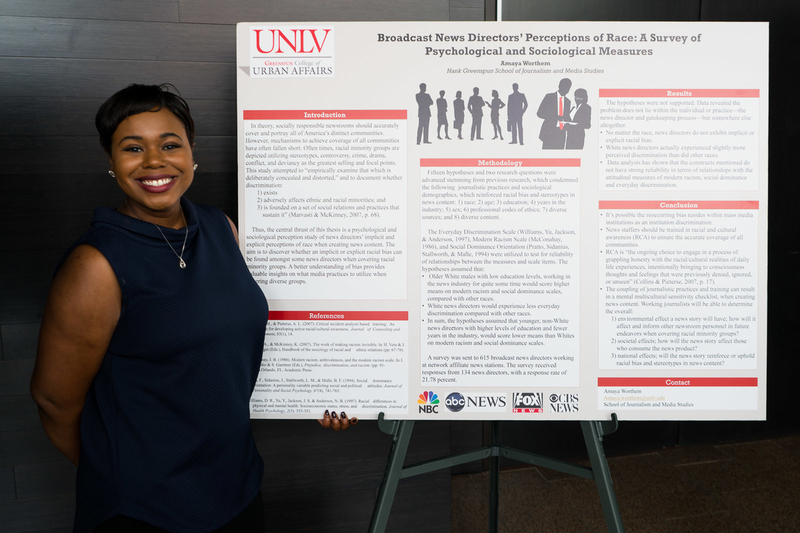 The bachelor's degree is designed to prepare students to become thoughtful scholars and effective professionals in broadcast journalism, integrated marketing communications, advertising, public relations, social media, media technologies, and digital media. Our master of arts degree emphasizes methodological and theoretical exploration in various areas of journalism, and in the form and content of media. Students acquire tools for conducting graduate-level research and for producing scholarship. Students with professional backgrounds apply their experience in advertising, emerging media, film, the Internet, media management, print, public relations, and television to deeper studies of their effects at social and individual levels. Students develop a deep understanding of the media and develop expertise on journalistic and mass-mediated problems and issues. They become better consumers of media messages, developers of content, and critics of mediated subject matter. Because each student’s goals are unique, the program is flexible in developing individual program curricula. In the end, students balance the discipline’s varied traditions in theory, history, and research with attention paid especially to the changing media landscape of the twenty-first century. A student interested in studying a topic not offered can team up with a journalism faculty member for an independent study. Faculty members mentor and supervise students as they explore niche areas of interest within the field of journalism. Progress can be tracked by using a degree worksheet. Print and fill one out before seeing an advisor for faster, more informative meetings. Update it as needed to track academic progress.